Heat oil in large saucepan over medium heat. Add bell pepper; cook and stir 4 minutes. Add zucchini and garlic; cook and stir 3 minutes. Stir in tomatoes, salsa, chili powder, and oregano; bring to a boil over high heat. 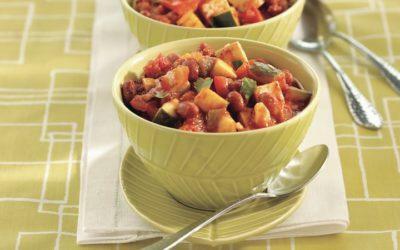 Reduce heat to low; simmer 15 minutes or until vegetables are tender. Stir in beans; simmer 2 minutes or until heated through. Stir in tofu; remove from heat. Ladle into bowls; garnish with chopped cilantro. Note: Tofu is made from the curds of soybean milk. It has a bland, slightly nutty taste, but readily takes on the flavor of foods it’s cooked with. It’s available in 3 forms: soft, firm, and extra-firm. Cover any leftover tofu with water and refrigerate. Exchanges per serving: 1 Bread/Starch, 2 Vegetable, 2 Meat.